Sam is twelve! Friday was his birthday. We started the morning with our usual sugar cereals of choice buffet. Sam took some brownies to share with his French class. 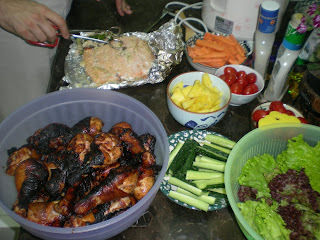 In the evening we had a salmon barbecue. Sam wanted to invite our friends, Lindsay and Travis Sevy and their children Maya and Asher, over to eat with us. 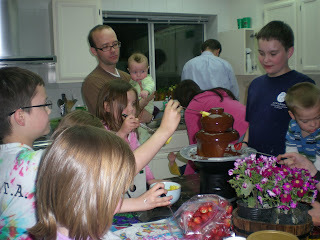 We broke out the chocolate fountain...not so hygienic...but fun. Rob and I have been hoping to start a little open mic tradition in our home with the sound system we've been collecting. So far we have more form than content, but we were happy to have Travis play and sing for us. Sam was excited to get some new movie buff books and some old classic movies from Grandma Martha. We got him some technology...a flip camera for his film making and a new cell phone. Saturday morning I woke to the Psycho theme song. He had already downloaded it as his cell phone ring. He and the boys spent the weekend making horror spoofs with the flip camera. Bethany was happy to be included. Sunday Sam was ordained as a deacon. He was beaming, as were we. 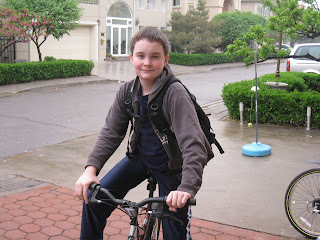 He turned twelve just included in the trip to Shen Zhen and Hong Kong for Youth conference and and temple trip, coming up this weekend. We are blessed to have such a sweet, funny, charming, talented son! Its always a pleasure to spend time at the school (barring the counselors office...I've done that too.) I was especially excited to spend time with Kyle's class today. The third graders were presenting their Cultural Museum. They have been long in the preparation....actually we kind of procrastinated and lost things here and there so we have been more short and urgent in the preparation. But it was a nice opportunity to discuss American culture, history, values and beliefs with Kyle. He is especially interested in Abraham Lincoln and Martin Luther King. So they all covered shoe boxes with white paper and decorated them with pictures from their cultures, which are certainly varied, and filled them with artifacts. Kyle brought money, a baseball pendant, some Obama pins, a Book of Mormon, a picture of our family by the Lincoln Memorial, a picture of his great-grandpa Alden, a book about Martin Luther King Jr. They gave short presentations wearing costumes from their country. Kyle wore his church suit. He was a federal agent. (I don't know why he didn't want to be a consular officer.) Then we got to wander about and appreciate the boxes of several classes. I think there are about five third grade classes. I'm telling you this is a big school. The best part is the school tradition of lining the hallways with the foods. Everyone is tempted to take pictures because its like a mini world tour. I feel kind of emotional at this time of year when all the field trips, picnics, performances start up. Wednesday I got to celebrate Earth Day with Olivia's kindergarten class. They had a litter-less picnic. It was a bit of a challenge to pack a lunch with no paper involved. I had to smile when one Mom showed up with a big take-out box of pizza. I think something got lost in translation. Its just great to spend a little time in their territory...cherishing this time of their lives. 2. The Embassy Easter activities...bunches of little ones on Saturday morning doing crafts and chasing after plastic eggs and our three big boys off on the shuttle to the embassy in the evening...they came home yelling "we found the golden egg" and carrying a beautiful big basket of goodies, their trophy. 3. Grandma's packages filled with peeps and jelly beans...reminding me of my childhood. 5. Cute kids in their beautiful new clothing in pictures with lilacs on trees. 6. Kids mauling the real bunnies in the clubhouse again. 7. We've been here long enough to say again. 8. Our pseudo-General Conference Session...sent from HongKong...more Good News. 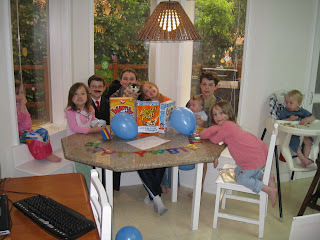 9.Our traditional Easter basket treasure hunt with rhyming clues...Ben loves to write...He wrote the clues this year. 10.Salmon roasting on the barbeque, our good neighbors outside at the playground, ending the evening talking about Easter with the kids. Today is Monday, Qing Ming, a traditional Chinese festival that became a national holiday in 2008. “Tomb sweeping” is the most important aspect of Qing Ming. 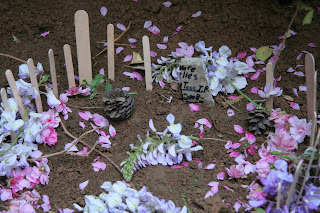 People take flowers , fruit, wine or other items to the graves of deceased family members. Qing Ming means clear and bright. It is also a celebration of Spring’s arrival. Rob and the children were off of work and school and everyone was ready to get out of River Garden and go on a family adventure. We decided to go to Beijing’s aquarium, The Blue Zoo. We managed to do a quick clean-up around the house and still be in the van around 10:00. We stopped at the little strip mall around the corner. I ran into Jenny Lou’s to buy water, bananas and pretzel bread and Rob took orders for what we call egg sandwiches made by the local vendors with their hot plates on carts on the back of their rusty bikes. Spicy or not spicy. Our second breakfast. We started into town. Spring has arrived. All throughout the countryside and city there are white tulip trees and mauve tulip trees, soft pink cherry blossoms, and bright yellow forsythia, and lime green, tender and new leaves on branches. Even the sun is yellow today! If we don’t have rain soon the sky will turn light brown with Gobi desert dust, but for today we were happy to see these signs of Spring back dropped by a bright blue sky. 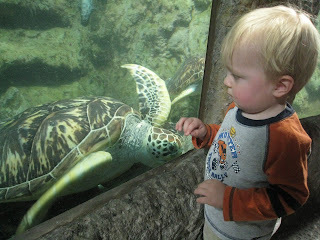 We didn’t check out the price of the aquarium before we left so we were a little nervous, but it wasn’t too bad. The cost was 75 yuan for adults and 50 yuan for children, kids under one meter were free. Our oldest, Sam, just qualified as a child. His twelfth birthday is a few weeks away. Caitlin, Grant, and William were free. The aquarium was nicely arranged and housed the usual favorites…big sea turtles, sea horses, exotic, colorful poisonous fish. 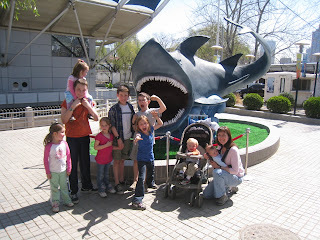 The kids’ favorite thing was the walkalator that we rode through a glass tunnel as sharks and eels and tuna swam overhead. We made it to the end more quickly than expected, but the kids were happy to go through again. It was fun to see the Chinese tour group of old men in matching hats file in around lunchtime. We left the main building and walked up some steep stairs to an older section that housed a seashell collection and a tank of fish that will come and nibble on your fingers…a crowd pleaser. 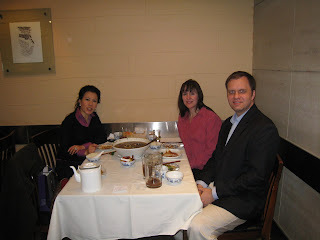 For lunch we had promised Kro’s Nest pizza, a favorite among Beijing ex-pats. The kids love the western atmosphere and the man flipping the dough almost to the ceiling…they swear, and the pepperoni, not salami, and the pizzas as wide around as your arms. The always beg us for root beer and we always say, “Not in China, it would cost more than the pizza.” Overall, the day was a success…a few tantrums here and there but most of the time we were happy and cooperative. What a blessing!